The garden may be quiet, but we’re busy, home and away with our friends and advisors in the UK. Ivan Le Tissier, Garden Administrator, together with Jan, visited Bridport Potato Day at the village hall, organised by a local gardening group. 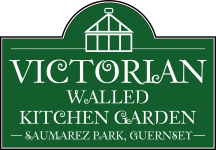 Chris Pennard, a familiar name to VWKG-ers, helped organise a sale of 85 varieties of potatoes, plus garlic, shallots, veg seeds, fruit trees and bushes. One thing Ivan liked most was the welcome at the door, by gardening club members. Members were very proud to show how the system worked, from their gardens and into the community. As Ivan says ‘it makes all the difference’. PS Broad bean seeds planted this week!